I’ve been dreaming of curtains for years now - the ones that elegantly move in slow-motion, as the wind plays with gravity and the sunlight is emphasising the colour of the fabric. This idea of curtains became even more outspoken and turned into a need-to-have, as the sun started to come out from its winter hibernation. Since our dining room window faces directly south, we have the sunlight making an entry from early morning and staying late into the evening. So curtains were not just a decorative, poetic drill, but an actual necessity, to avoid squinting at each other over lunch. Very happy that I stumbled upon Arne Aksel, who tapped 100% into that slow-motion wind play dream of mine with their colourful curtains. I found this newly established Copenhagen-based company via Instagram, where they have their curtains installed at various designer’s showrooms and homes. They work a lot with architects and also make curtains for vast spaces, events and fashion shows. They work from their workshop on Nørrebro, Copenhagen meaning the production is fast. They have installers that come to fix it all, which is included in the final price. A very simple set-up. There is no hiding the fact that this idea about long, flowy curtains was my idea. It’s no secret either, that I am the one making most of the interior decisions at home. Arne Aksel knew this. Well, that is because this is how it is in most households, apparently. And for that reason, Arne insisted that we set up a meeting where my boyfriend Oskar was present too. Arne Aksel and an installer from his team came around one late afternoon and we talked about colours, textures and the purpose of the rooms in the apartment. Arne had with him lots of fabric swatches, for us to get a better understanding of translucency, lightfastness etc. Whilst we were chatting away about colours, his installer was measuring up the windows and the ceilings, so that he had all the information on heights and widths digitally. Arne had lots of ideas, and like a magician he came up with some cool suggestions, most of which we loved. I trusted him so much, I even let him decide on a few of them. The whole process was smooth and easy. The sewing adjustments takes place in Copenhagen and the installers cut the rails ‘on site’ to get them super precise. First they sprayed something on the rails to make them slide, then they hung the curtains, followed by a ‘S-shaping’. Finally they were steamed to make any unwanted creases disappear. And voilá! Half of our apartment faces North, meaning no direct sunlight. From our livingroom windows we look out on the street, and to the building opposite. Since the light coming in from here, is mere reflection, and thereby not too much light, we wanted something that really let the light pass through. In curtain terminology: high lightfastness. Arne suggested Rocket - a modern warp knit fabric, featuring a chainmail-like pattern of oval shapes. As it hangs there it seems light, but the fabric has some really lovely volume to it. We wanted to enhance this, and therefore we kept the length long, allowing it to drape on the floor and act out its forms a little more. We stood between an orange and an army green, and finally ended up with the green. From our dining room window you look out on trees and gravestones. An ever changing seasonal palette of natural colours, and the sun kicking in hard. This part of the apartment faces directly South, meaning that whenever the sun is shining, it is 100% present in our dining room. This also means that we really needed to be able to shut out the light, in order not to be squinting at each other over breakfast. We therefore went with 2 layers. One being the more light, translucent one, and the other a heavier one, serving the purpose of keeping out the sun. Or, as I’ve found, to add tonnes of glamour to our dinner parties. Originally I had thought of light pink. Then I changed to light yellow. I’d shared my contemplations with Oskar, and he was more for the light pink (!). When we sat there, Arne grasped on to Oskar’s wishes and decided on the pink for us. When it came to the second, heavier curtain he let Oskar decide. 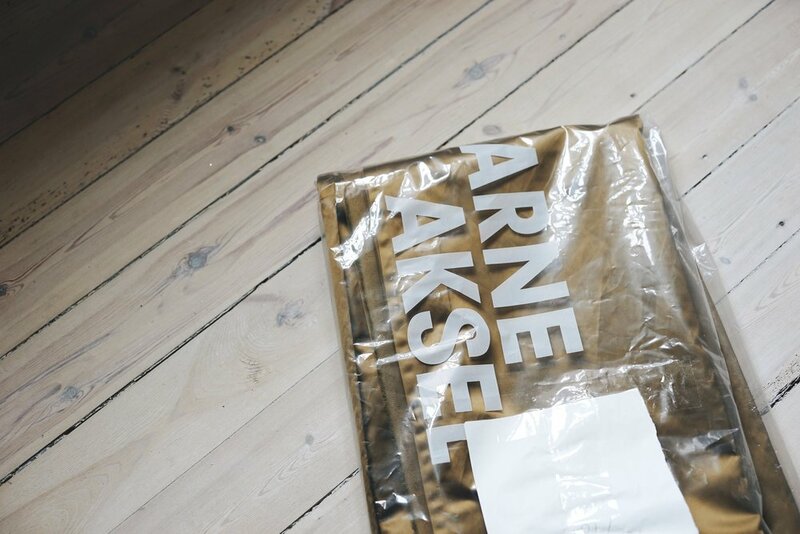 We agreed on a kind of scale of colours, Arne pointed at the six of them, and then asked Oskar to chose one. He chose a beautiful tone of golden brown, with a hint of moss green. It’s a colour which is difficult to define, and I love colours like that. The light pink one is Air - the kind of curtain you see moving in slow motion once there is a windy breeze. The fabric is from Kvadrat and this colour just makes me smile every time I see it. I am in love with this curtain, full stop. The golden brown is Tiber - an elegant take on sateen, that has a gorgeous way of folding as it hangs. They are really super bold and expressive, and they add such a warm, ambient feel to our space. They hold out the light and can be drawn in the evenings for extravaganza - disco vibes! Like the living room, this window faces North onto the street. We are either working in the office on our computers or we have a guest staying over on our air mattress. So for this purpose, we wanted to go with two layers, to block out the light. Our walls here are a warm grey, and Arne decided on a petroleum colour for the curtains. At that point I wasn’t too sure about us even getting curtains in that room, because it is very small, but then again, I think I want to be able to draw them every now and then. We went with a light Air to let through as much light as possible, combined with a darker shade of petroleum for the thicker one. For this we went with Heavens Gate - a soft velour, that strangely enough both absorbs the light and reflects it. And they look really good with the grey walls. During the bright afternoon hours (above), the room turns warm and the curtains are looking soft and as if they are melting in with their surroundings. During the blue hour around 6-7pm (below), the dining room turns more subtle, the pistachio coloured ceiling reflects its green, to mute the saturated pink and gold.